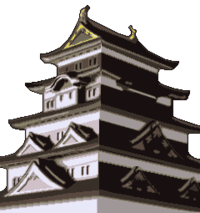 The Castle in Diamond City appears in the style of a 16th century Japanese castle. Its owner and only known resident is a prince or princess in Japanese attire named after the player. The ninja sisters Kat and Ana are obviously in good terms with the royal person. In WarioWare, Inc.: Mega Microgame$!, an evil skeleton spirit named Boneheads appeared over the Castle's roof at night and took possession of its sleeping owner. Ana and her crew of ninjas failed at defeating the spirit, and so Boneheads captivated the ninja girl. He gained full control of the royal person and the sky turned red. However, Ana previously managed to send a letter to her sister Kat with Don the Sparrow's help. When Kat received the message, she and Paw the Dog made their way to the castle and reached the roof, where Boneheads waited for them. With the help of Paw, who turned into a big sword, Kat managed to cut the evil spirit up. The sky became blue again and peace returned to the Castle. The Castle was also briefly seen in the map of Diamond City in WarioWare, Inc.: Mega Party Game$!. It has yet to return in another game. ↑ From the opening scene of Kat and Ana in iQue's localization of WarioWare, Inc.: Mega Microgame$!. This page was last edited on April 2, 2018, at 20:29.